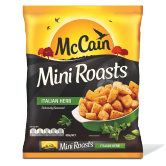 1 pkt of McCain Mini Roasts Italian Herbs, heated as per directions on the packaging. Chop all ingredients and place in a small side bowl finishing with the feta. 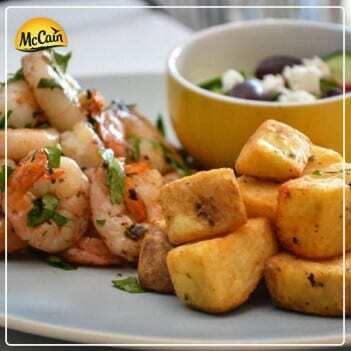 Drizzle with olive oil and a squeeze of lime juice. Add salt and pepper to taste. 1. Heat the oil in a large frying pan. Add the prawns and cook on high heat for approx. 5 minutes. Once cooked, stir through the chopped parsley and serve immediately. 1 Heat the oil in a large frying pan. Add the prawns and cook on high heat for approx. 5 minutes. Once cooked, stir through the chopped parsley and serve immediately.